Mixed fortunes in the news today for two specialist retailers that both have a presence at Team Valley Retail World in Gateshead – HobbyCraft and Borders. Privately-owned HobbyCraft, which describes itself as “the UK’s largest chain of dedicated arts and crafts superstores”, has reported a 67% leap in full year pre-tax profits, with like-for-like sales over the last 35 weeks rising by 9%. Rather than suffering in the downturn, HobbyCraft has capitalised on Britons’ rediscovered enthusiasm for ‘making their own stuff’, firmly establishing itself as the market leader and expert in its field. Furthermore, with a compact estate of only 38 stores, there’s still plenty of scope for it to grow. 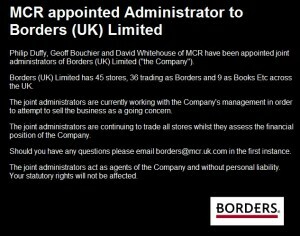 In contrast, today’s announcement that Borders UK has gone into administration comes as little surprise, after months of speculation about the 45-store bookshop chain’s future. Just as Safeway in the UK was latterly an entirely separate business from the (still going) US chain of the same name, Borders UK no longer has any connection with the US Borders Group, having been sold off to private equity investors Risk Capital Partners in September 2007, and then sold on again, to Valco Capital Partners, in June 2009. Just in the last few days, WHSmith is reported to have pulled out of talks to possibly buy the chain. I’ve always enjoyed visiting the Team Valley Borders store – it is clean, spacious, and reasonably well-stocked, and I’ve always been impressed by the smartness and friendliness of the staff. 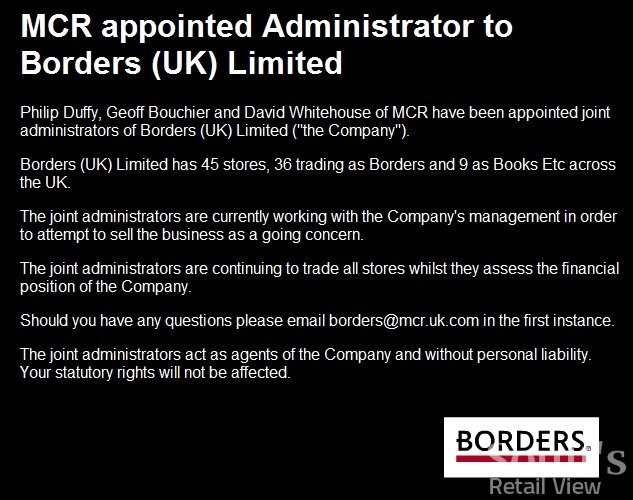 As a retail brand, however, I think Borders in the UK has struggled to define a truly distinctive position – what exactly is it, for example, that makes a Borders store different from a branch of Waterstones or WHSmith, or, indeed, that gives it an advantage over Amazon.co.uk? Beyond the delightful aroma of Starbucks coffee, it’s difficult to think of an answer. 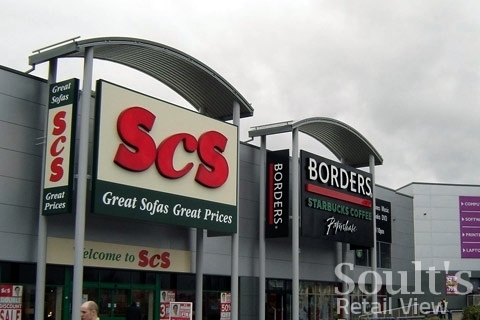 For the sake of the 1,100 staff who tonight are fearing for their jobs – including those at the North East stores in Silverlink and Stockton, as well as Gateshead – it would be excellent news if a buyer for Borders could be found. In reality, though, it’s hard to see any other retailer that would want to buy the entire business as a going concern. After all, it’s already been through three owners in as many years, and even in 2007 had found itself in that awful place where journalists prefix any reference to Borders with the adjective “troubled”. More likely, sadly, is that WHSmith will cherrypick the best retail park sites, with Waterstone’s perhaps picking up one or two city centre stores; however, there are likely to be few such locations where the HMV Group-owned Waterstone’s isn’t represented already. Interestingly, it’s exactly a year ago today that Woolworths went into administration; since the demise of Zavvi just a month later, HMV has had the high street music and DVD market virtually to itself. Now, with the possible fall of Borders, its sister company Waterstone’s might well find itself in a similar position of dominance. At a time of recession, HMV’s resilient performance – seeing an 11.5% rise in annual profits – is to be commended; similarly, Waterstone’s continued presence and growth on the high street, in the face of intense competition from online stores, is surely welcome. Our town and city centres will be poorer, however, if Waterstone’s – having already swallowed Dillons and Ottakar’s in its lifetime – is the only choice of bookshop we have left. Next story Vælkomin til Newcastle!